If it were me, I'd remove the white/green wire from the connector and feed B+ to it. That would be clean and simple to test and install. PS.. When I removed that wire from my connector, I had no continuity between it and ground. If your harness is shorted on that wire, it will show continuity to ground. A grounded wire would most likely blow a fuse though. Last edited by pcb; 10-02-2018 at 11:30 PM. I just checked my fuse block again and I have continuity between my INJ fuse and terminal "I" where the white/green wire attaches. That means B+ is going to my white/green wire. I'm pretty sure that your white/green wire isn't making contact with the pin of the fuse block. Put on a pair of strong reading glasses and remove the white/green wire from the connector and carefully clean it and gently try to pinch it together tighter to make better contact. Clean up (with some fine grits and paper) the terminal "I" in the fuse block. If you look down into an empty socket in the connector, you can see the tiny tab you have to push to remove a wire from the connector. I am now 97% sure that we have found your problem and you can fix it without any Jerry rigging or fancy wizardry. Just be gentle with the tiny connector so you can reinstall everything. Last edited by pcb; 10-03-2018 at 12:16 AM. 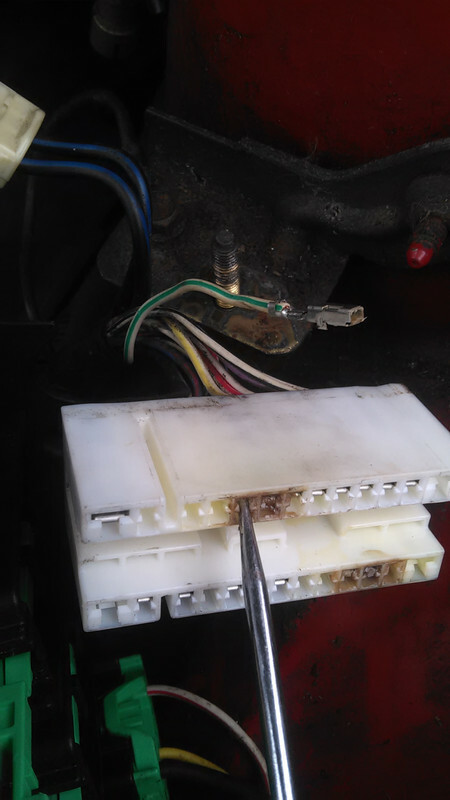 If the terminal on your white/green wire gets screwed up, you can remove a wire and terminal from the connector on your parts car and connect it to your white/green wire. Just snip off a few inches and join the wires together, then it'll plug right into your connector. Try to use one that is the same gauge as you're white/green wire. Here's a picture of the terminal in the fuse block that feeds B+ into the white/green wire. I still do not have a clear understanding of the system and the role that the white/green wire plays. Re-reading posts, at one point you directed me to measure the white/green wire at the BACK side of the terminal with everything hooked up. This isn't possible, I don't have long needle-thin leads on my voltmeter. 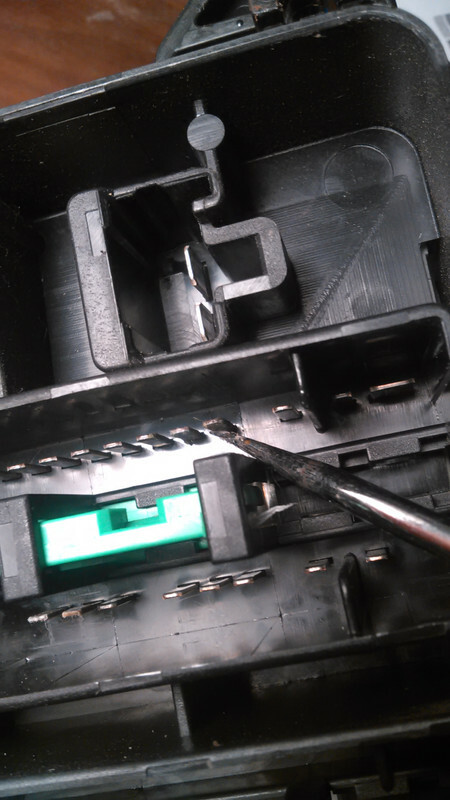 I measured the white/green at the accessible connector while unattached, after blasting the heck out of it with contact cleaner, drying it with compressed air can, and verifying that the connectors look fine. Are these 2 statements correct? 1) High-amp power goes from battery to 30 amp INJ fuse, then to R9 Output side of Main Green Relay then to Output side of Fuel Pump Relay, then to fuel pump and car runs. 2) ECU sends low-amp power to R7/R8 Input side of Main Green Relay (is this the role of white/green?) and to Input side of Fuel Pump relay. This means there are conditions where the ECU will not send Input power, the relays will not close and no high-amp power goes to fuel pump so car cannot run. High amp power goes from the battery to the INJ fuse then to the INPUT side (R9) of the main relay where it waits for the control circuit (R7 & R8) to activate the relay and send power from R9 to R10. Power then goes from R10 (high power output) to the fuel pump relay high power INPUT side where it waits again for the ECU to call for power on the signal terminals of the fuel pump relay to send power to the fuel pump. So, power goes directly from the INJ fuse to the R9 terminal and ALSO goes directly to the white/green wire where it goes to the ECU to power it. The white/green wire is fed B+ directly from the INJ fuse. It isn't switched on and off through the relay. 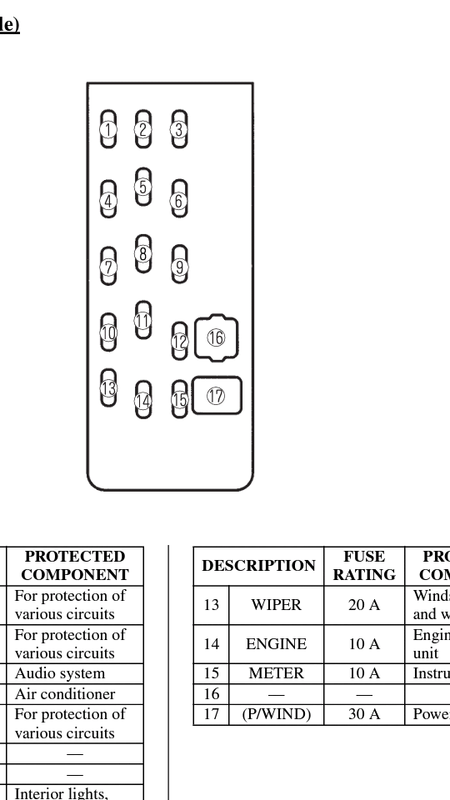 There should be B+ going from the INJ fuse, to the white/green wire then over to ECU where it powers the ECU. My car was idling like crap yesterday and I thought my IAC was dirty or something, but then I realized I had pulled out my INJ fuse to test for voltage on the terminals which killed the power to my ECU and I lost my memory so my IAC had to relearn how to idle the car. If you don't have B+ going from the INJ fuse then over to the ECU, then you will never have the relays switched on by the ECU. I'm calling R7 and R8 the control circuit side of the relay and R9 the input and R10 the output. You need to find out if there is power going down the white/green, with everything connected. You could poke your test lead through the plastic casing on the wire (maybe sharpen the point a bit) or test for B+ at the ECU on pin #4 and pin #55. Both #4 and #55 are white/green as well, right at the the ECU. 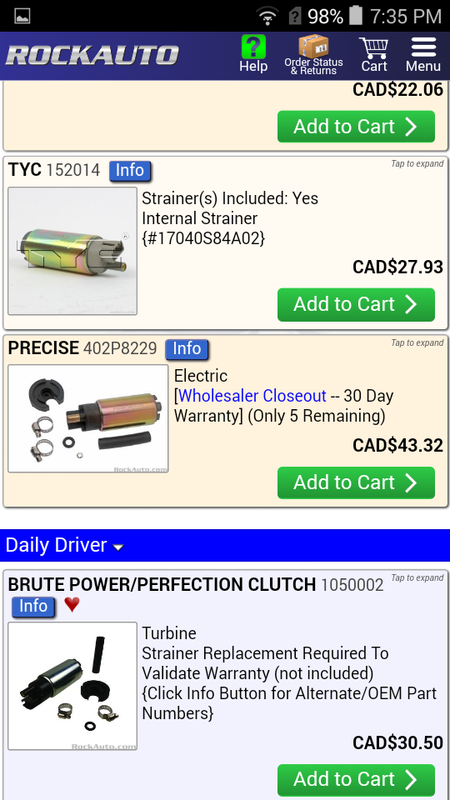 You can unplug the ECU connector to test for B+. If you've got B+ at the ECU, then either power isn't getting from the ECU to the R7 and R8 of the main relay or your ECU is fried. That is correct except power goes in on the R9 terminal then out on the R10 terminal where it goes to the fuel pump relay then to the fuel pump and runs the car. 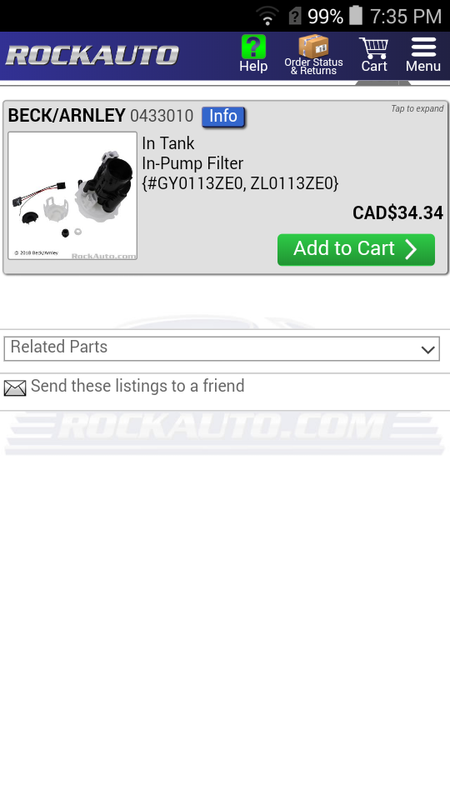 R10 also goes to the injectors, purge solenoid valve and vehicle speed sensors. Yes, indirectly, the ECU needs power coming into it on the white/green wire before it will send power to R8 and R9. and to Input side of Fuel Pump relay. No,.. The control signal and the high power input come from R10 of the main relay. 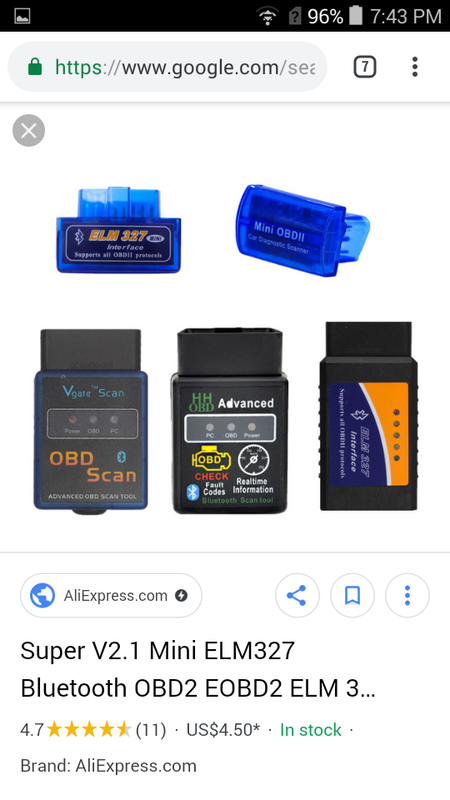 This means there are conditions where the ECU will not send Input power, the relays will not close and no high-amp power goes to fuel pump so car cannot run. As soon as you turn your ignition on, the main relay should switch on, sending power to the fuel pump relay and fuel injectors. That leads me to wonder about your ignition switch again,.. If power isn't getting through it when you turn the key on, then the ECU doesn't know your key is in run or start position spit doesn't power up the main relay. Check Your Engine Fuse !! I thought the main relay had both R7 and R8 controlled by the ECU but you should get B+ from the battery, through the ignition switch, then through the engine fuse, then to your relay. Either R7 or R8 should be B+ with the ignition on. Blowing a fuse makes a lot more sense than a bad connection based on the way your car died all of a sudden and stayed that way. A bad connection would most likely be intermittent. Your spark-wizard diagrams are beginning to make sense. 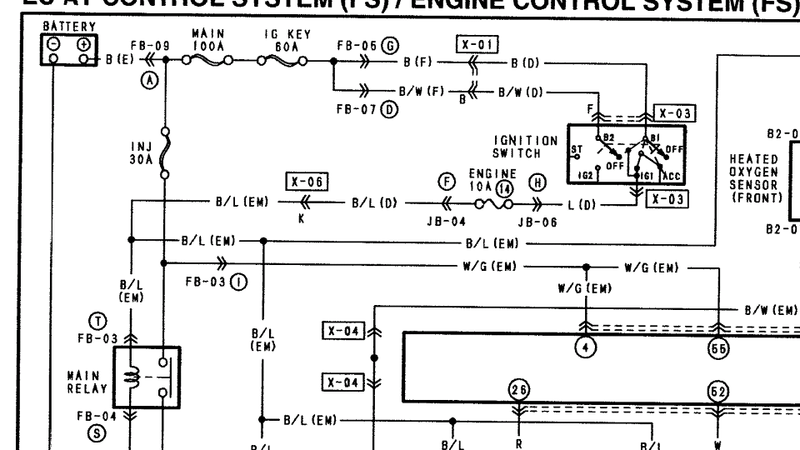 I see that ignition sends power througt that footwell fuse to input/control/signal side of Main relay. It never occurred to me to check footwell fuses! After a merry trip through the garden chasing wild gooses, I think we got it !! Don't count our wild geese before they are caught. I have 4 or 5 more hours of work before an hour drive home in my gas-guzzling truck before I can get to that fuse. My fingers are crossed, but the Blue Lemon knows no mercy. 10amp Engine fuse in footwell was blown. B+ power confirmed at both Input and Output of fuel pump relay. No fuel getting to motor yet. At fuel pump, power present on one set of terminals but not the other - must be the fuel level sender because I pulled the fuel line and no gas is spurting out under cranking. Swapped fuel pump relays, same. I'm thinking bad fuel pump and clogged high pressure fuel filter. The clogged fuel filter with a pump trying to push fuel through it blew the fuse. Remember this is Canadian dollars... You guys pay like two bucks. I just got my JIS bits today !!! 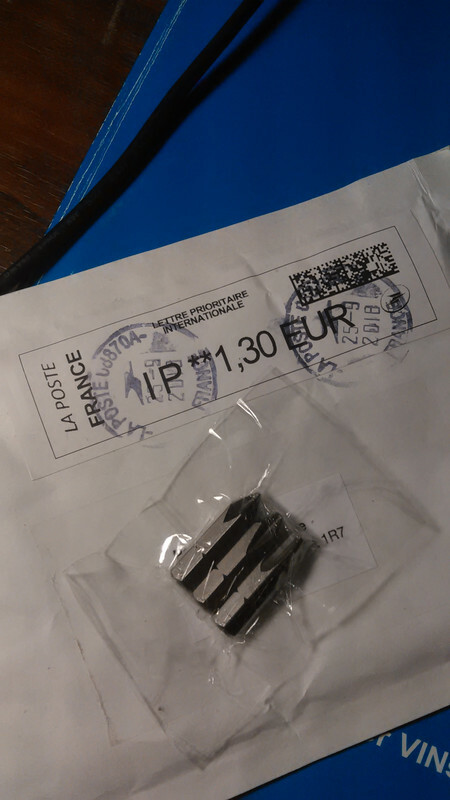 All the way from France !! I might go and remove my IAC from the parts car just to see if they work !!! Last edited by pcb; 10-03-2018 at 07:54 PM.